Rohsenow, John S. (2004). 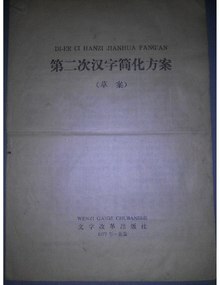 "Fifty Years of Script and Language Reform in the PRC". In Minglang Zhou (editor); Hongkai Sun (consulting editor) (ed.). Language Policy in the People's Republic of China: Theory and Practice Since 1949. Language policy. 4. Boston: Kluwer Academic Publishers. ISBN 978-1-4020-8038-8.